AYUSH - National Eligibility Test (NET) for Ph.D. Fellowships/ Senior Research Fellowships (SRF): Central Council for Research in Ayurvedic Sciences (CCRAS) will hold the examination for AYUSH National Eligibility Test tentatively on 13-11-2018 for determining on eligibility of the Indian National candidates for the award of Ph.D. fellowship (SRF) in AYUSH streams i.e. Ayurveda, Yoga & Naturopathy, Unani, Siddha and Homoeopathy. The Central Council for Research in Ayurvedic Sciences (CCRAS) has released the examination date of AYUSH National Eligibility Test (NET) 2018. This year, the AYUSH NET will be held on November 13 at various test centres across the nation. The examination is held for awarding PhD fellowship (SRF) in related streams. The CCRAS will conduct the exam on behalf of Central Council for Research in Yoga and Naturopathy (CCRYN), Central Council for Research in Unani Medicine (CCRUM), Central Council for Research in Siddha (CCRS) and Central Council for Research in Homoeopathy (CCRH). All the candidates with MD/MS in any AYUSH streams or graduation with give years of experience can appear for this exam. 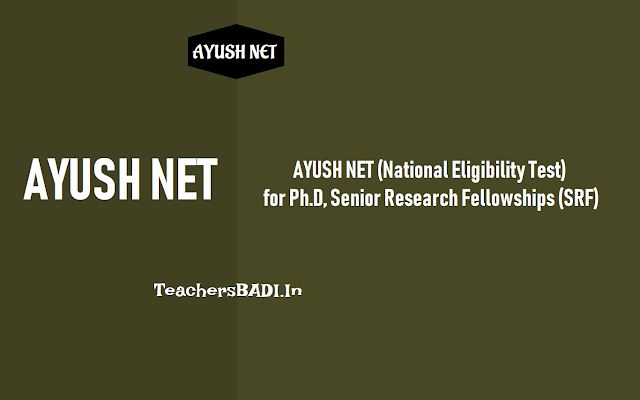 Research Fellowship (Medical): SRFs will be awarded each year by the concerned Councils to candidates, holding post-graduation (MD/ MS) in any of the AYUSH streams with the exception in Yoga and Naturopathy for holding either PG (MD(Y/N)) or Graduation (BNYS) from a recognized University with 5 years experience, after qualifying the AYUSH National Eligibility Test (NET) conducted by the designated Research Council (CCRAS) of the Ministry of AYUSH. The applicants should not exceed the maximum age limit of 32 years as on January 1, 2019. Part 2 (Subject specific section: Ayurveda, Yoga and Naturopathy, Unani, Sidhha and Homeopathy). Further, the exam will carry a total of 120 marks. The exam will be held in Delhi NCR, Mumbai, Kolkata, Chennai and Guwahati. All the candidates need to pay apply online along with exam fee of Rs. 1000 (Rs. 250 for OBC candidates and 250 for SC/ ST/ PH candidates). A candidate may apply for ‘Ph.D. fellowship (SRF) in concerned AYUSH streams. The on line Application Form (Annexure-I) is available at websites of Research Councils viz. CCRS- http://www.siddhacouncil.com and Ministry of AYUSH http://ayush.gov.in. and performance in the test, subject to the condition that they fulfil the laid down eligibility criteria. If a candidate is found to be over-age for Ph.D. fellowship (SRF) his/her candidature will automatically be cancelled.